Blake and the 2006 Belgian Warmblood gelding (Heartbreaker x Jus de Pomme) captured the blue ribbon after challenging the course, designed by Anthony D’Ambrosio of Wellington, FL, and completing the jump-off in 41.998 seconds. 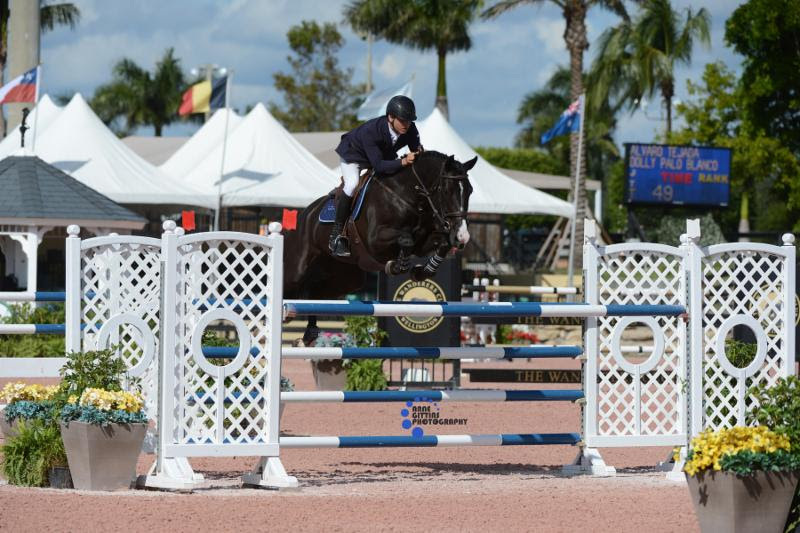 Emanuel Andrade of Wellington, FL, had another successful weekend, riding to both a second and third place finish after faultless jump-off rounds. Andrade piloted his own Ricore Courcelle, a 2005 Selle Francais stallion (Quaprice Bois Margot x Alme), to finish the jump-off track in 43.572 seconds, alongside Jenni’s Chance, a 2009 Belgian Warmblood mare (Clinton I x Heartbreaker), contesting the short course in just 44.343 seconds. 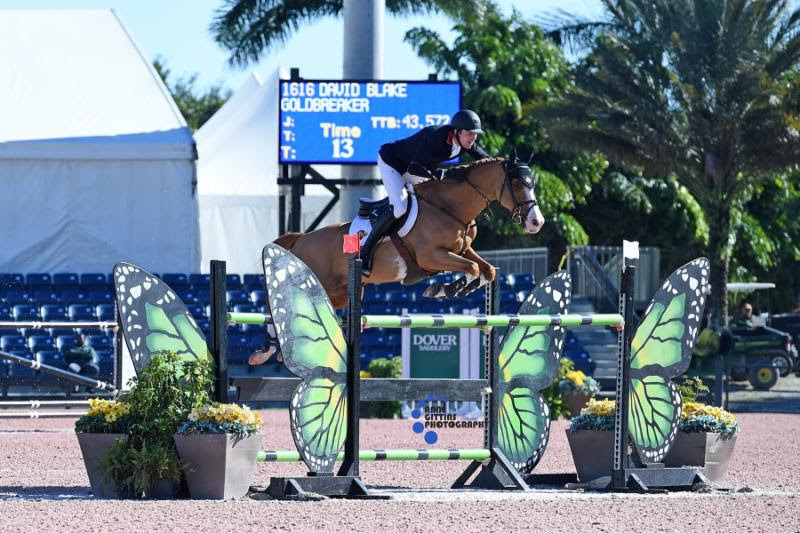 The ESP Holiday Series will continue with four more weeks of top hunter, jumper, and equitation competition before the start of the 2018 Winter Equestrian Festival (WEF) on Wednesday, January 10, which will continue through Sunday, April 1. The $10,000 #1 Education Place Open Welcome Stake was won by Alvaro Tejada of Guatemala and Dolly Palo Blanco, owned by Agroprosa, after crossing through jump-off timers in 36.253 seconds. Alejandro Karolyi of Wellington, FL, and VDL Elliot, owned by Bo Hopson, collected second place with a time of 38.553 seconds. Alex Granato of Wellington, FL, and Beorn, owned by Moyer Farm, LLC, finished in third place after finishing in 36.876 seconds with four added faults. The $4,000 Marshall & Sterling/NAL Child/Adult Jumper Classic saw Kristen Franz of Wellington, FL, and her own Cypress finish atop the class as the fastest combination contesting the jump-off with a time of 34.258 seconds. Olivia Minicucci of Montreal, QC, and her own Arian P earned second place after completing the short course in 38.384 seconds. Elle Haymond of West Heartford, CT, and Tibri LLC’s Dalaide de Longpre, finished in third place after stopping the timers in 40.206 seconds. Sarah Hubbard of Cornwall, CT, rode to victory aboard Coline, owned by Hubbard Horses, LLC, in the $5,000 1.35m Classic after stopping the jump-off timers in 43.707 seconds. 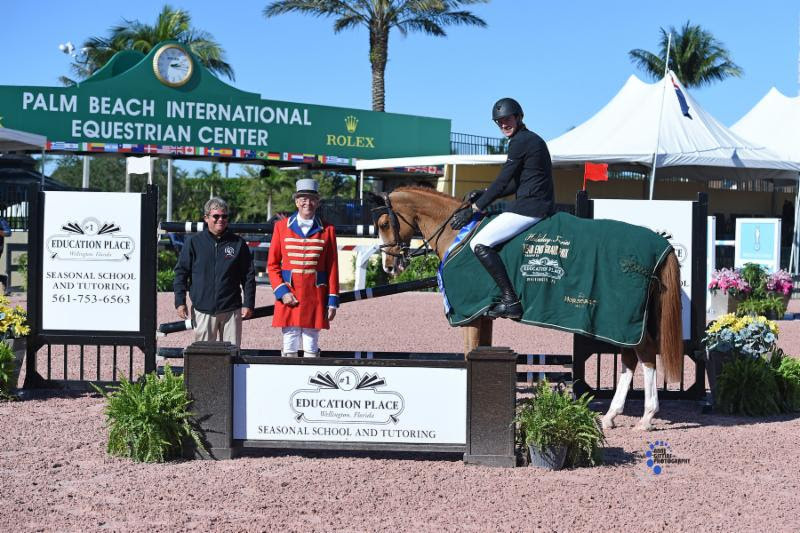 Benjamin Meredith of Wellington, FL, and Golden Point Partners LLC’s Frescon took second place with a time of 44.273 seconds, while Riley Newsome of Medham, NJ, and Dakar VDL, earned third place after crossing through the finish in 40.338 seconds with four faults. The $1,500 Low Adult Jumper Classic was won by Jennifer Evancic of Versailles, KY, and her own Loguestown Lass, with a jump-off time of 33.636 seconds. Second place went to Sabrina Greenwell of Loxahatchee, FL, aboard Canieta, owned by Greenwell, after finishing the jump-off in 33.815 seconds. Rounding out the third-place position was Tracey Cover of Delaplane, VA, and her own Vienna, who completed the short course in 34.551 seconds. The $1,500 Low Children’s Jumper Classic awarded first place to Joshua Baird of St. Charles, IL, and Sonas Douglas, owned by Heidi Schaefer, after dashing through their jump-off round in 29.74 seconds. Anika Lozano of Guatemala, rode Varcotique AC, owned by Roberto Daza, to second place with a jump-off time of 31.988 seconds. Third place was captured by Ella Hess of Boca Raton, FL, aboard All’s Well, owned by Susanne Richey, completing the track in 36.793 seconds. Christopher Payne of Cincinnati, OH, and Pure Giving, owned by Julie Holzberger, took champion honors in the USHJA Hunter 2’9″ Division. Sarah Kruel of Wellington, FL, and her own Opulent, received reserve champion honors. The USHJA Hunter 2’6″ Division was captured by Kelly Mullen of Franklin, TN, piloting Three Wishes, owned by Warioto Farms LLC. Reserve champion also went to Mullen, and Warioto Farms LLC’s Valentino. Jessica Hodnicki of Hamilton, NJ, and Jethro, owned by Cheyenne Sickle, were champions of the USHJA 2’3″ and 2′ Hunter Division. Reserve champion was awarded to Anabella Cottone of Davie, FL, riding her own Aurora. Katharine Ellis of Weston, MA, was awarded champion of the Medium/Small Pony Hunter Division. Her winning ride was Haley Ray’s Blue Moon. Reserve champion was presented to Sydney Raidy and Hershey’s Kiss, owned by Jessica Bader. The Low Adult Hunter Division champion was awarded to Kristin McCuin of Fort Worth, FL, riding Centoon, owned by NSL Ventures LLC. Reserve champion was awarded to Lyda Denney of Wellington, FL, and her own Lubek. 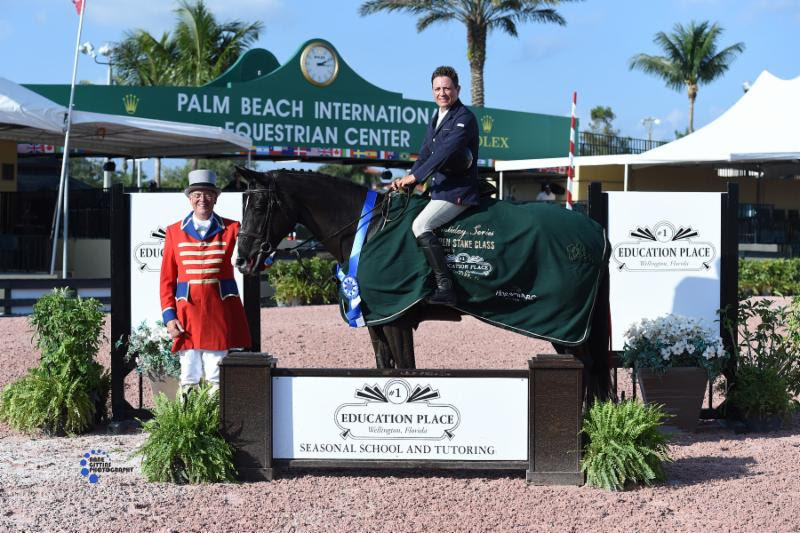 Competition will resume at PBIEC on Tuesday, December 12, with the ESP Holiday Series, featuring Holiday I continuing through Thursday, December 14. For more information please visit www.pbiec.com. To view the ESP Holiday Series Prize List, click HERE.